Rachel had some impressive wins this year in her most important meets. 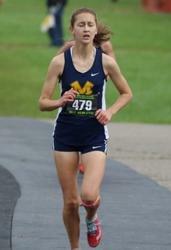 She won the Southwestern Buckeye League meet in 18:02, her fastest time of the year. She next won the VOA DII District meet in 18:11.06. She followed that up by winning the Troy Regional DII title in 18:35:22. Last but not least, she finished third at the OHSAA State DII Championship in 18:25.60. In the picture above, she is shown running at the state meet where she recorded the highest place of any VOA district runner in any girls division.